Obesity, in postmenopausal women, has been associated to a higher breast cancer incidence and worst prognosis. Some studies suggested a decrease in aromatase inhibitors (AI) efficacy in obese postmenopausal breast cancer patients, although estradiol levels were not measured. The purpose of the present study was to verify if estradiol levels are measurable in postmenopausal women under AI. If achievable, the goal is to compare the estradiol levels in lean versus obese postmenopausal women under AI treatment for non-metastatic breast cancer. Postmenopausal women were recruited in accordance to one of these four groups: lean [body mass index (BMI) of 18–25 kg/m2] under AI (n = 30), obese (BMI ≥30 kg/m2) under AI (n = 30), lean AI-naïve (n = 10), and obese AI-naïve (n = 10). Lean and obese women were matched according to their age. Estradiol levels were measured in plasma using an ELISA. The Wilcoxon signed-rank test was used to assess the significance of the differences between the groups. Estradiol levels in postmenopausal women under AI varied from 0 to 94.65 pg/ml with a median value of 0.98 pg/ml. Obese AI-naïve women had higher estradiol levels than lean AI-naïve women (p = 0.03). There was no difference in estradiol levels between lean and obese women under AI (p = 0.76). Despite very low plasma levels, it is possible to measure the estradiol levels in postmenopausal women under AI treatment. Our results suggest that the known impact of obesity on recurrence risk in women under AI treatment may not be due to incomplete aromatase inhibition. 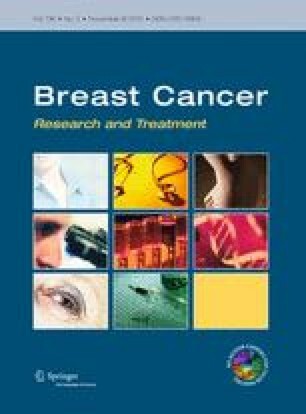 Further works are needed to examine closely the aromatase-independent pathways that are linking obesity to breast cancer risk and recurrence. Caroline Diorio and Julie Lemieux contributed equally to this study. C.D. is a Junior Investigator of the Canadian Research Society (2011-700657). J.L. is a Clinical Research Scholar from the Fonds de Recherche du Québec—Santé (FRQS). This study was supported by an unrestricted grant from Pfizer Canada.